So I guess if you lose your voice, it’s time to write a blog post? – Nice dress! Thanks, I made it!! So I guess if you lose your voice, it’s time to write a blog post? Lying here on the couch, watching TV and reading other blogs, fighting off my cold with hot chicken soup, hot tea and a chocolate bar (a recommended cure, honestly! ), I have decided I might as well write up one of my own on what I put together last week. Perhaps you remember my sister, Bon-Bons & Bootcamp? Well my sister made me a purse (I shall have to blog about it to show it off to you). 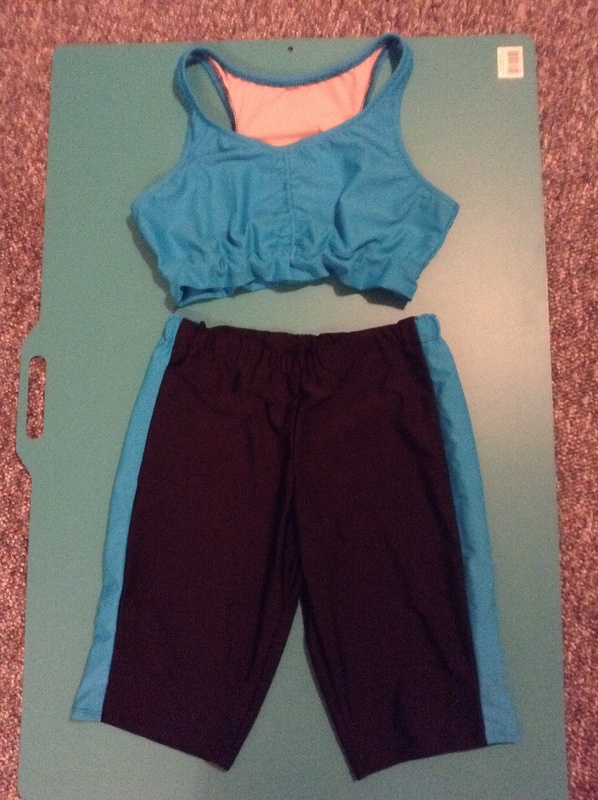 So in return I offered to make her some workout gear – seems I can’t stop myself from “Diving into knits!” She gave me the material (a lovely blue and a black – polyester spandex), thread and a couple of patterns with a request to make McCall’s M6360, view F, and McCall’s M4261, view C. The pants black with a blue side stripe and the bra top all blue. She gave me ALOT of material to work with! 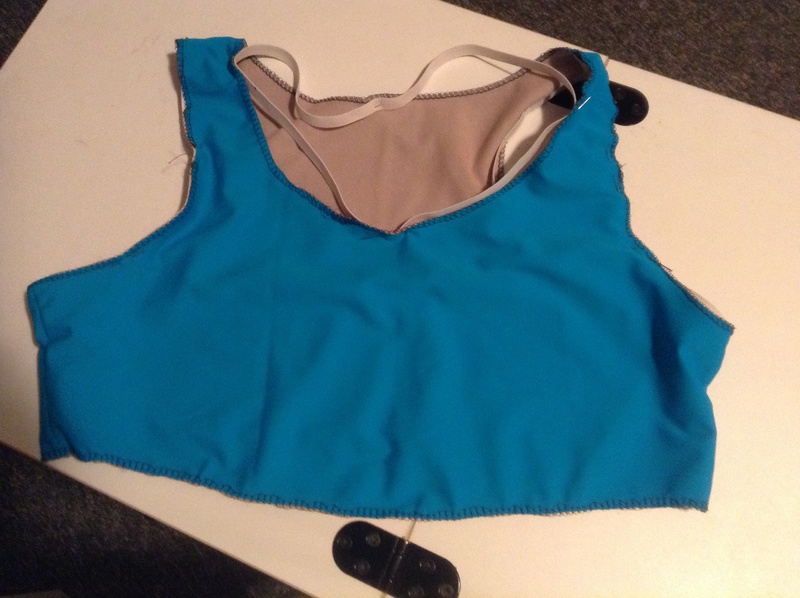 I could have squished the bra top and the bottoms on the smaller piece and still had 2/3rds left (all the blue), but I resisted my urge to squeeze a few cents out of the material and did as requested! The pants were so easy to sew up! First I sewed the stripes on each side, then the inseam and then the crotch seam. Again an easy pattern, just the one piece, plus the stripes. My sewing machine didn’t have any problem with this material. I used a “stretch” needle, polyester thread, and a narrow, long zig zag stitch. My serger on the other hand did miss a stitch here and there but I wasn’t worried because I used the serger to bind the seam edges only, after I sewed them all. Wouldn’t want to pop a seam in the middle of a “downward dog”! 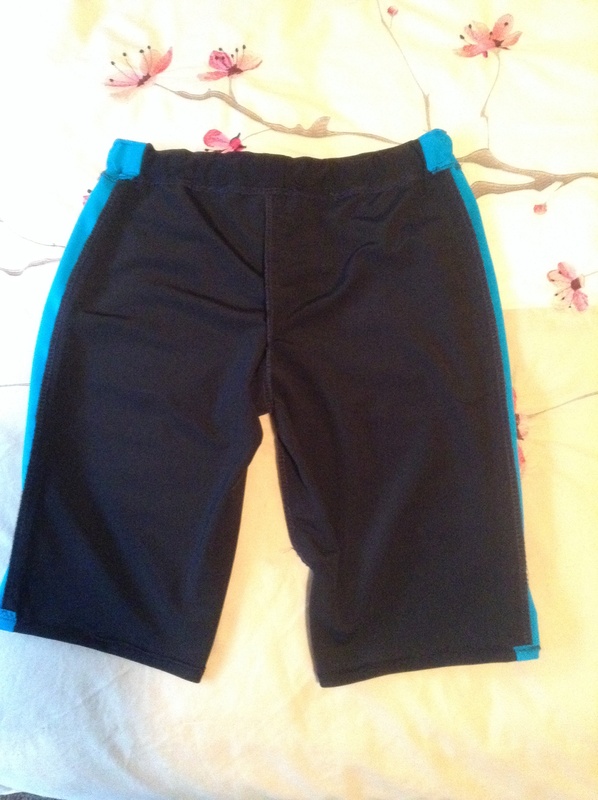 I folded the top over the waistband elastic and sewed it down. I hemmed the bottoms with a twin needle. 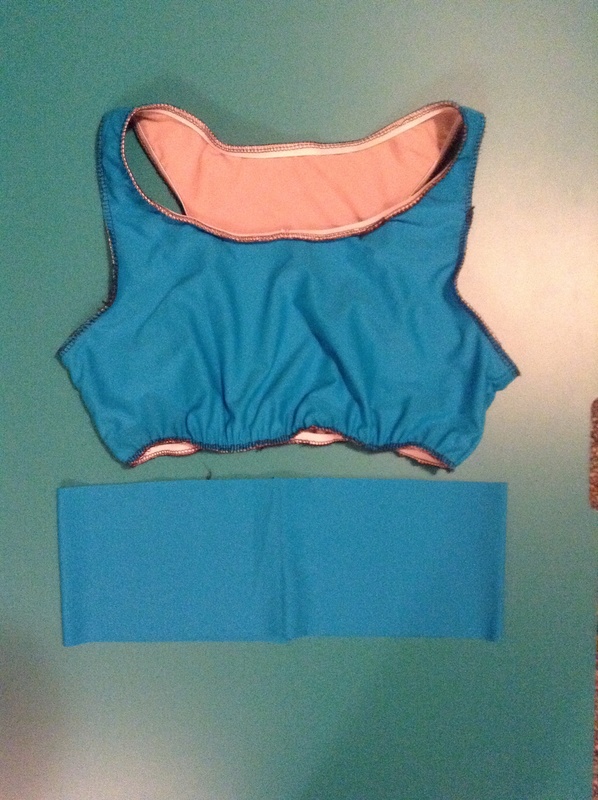 Next, I started with the bra top, cutting out the blue fabric and the lining and sewing up the shoulder and side seams on both. 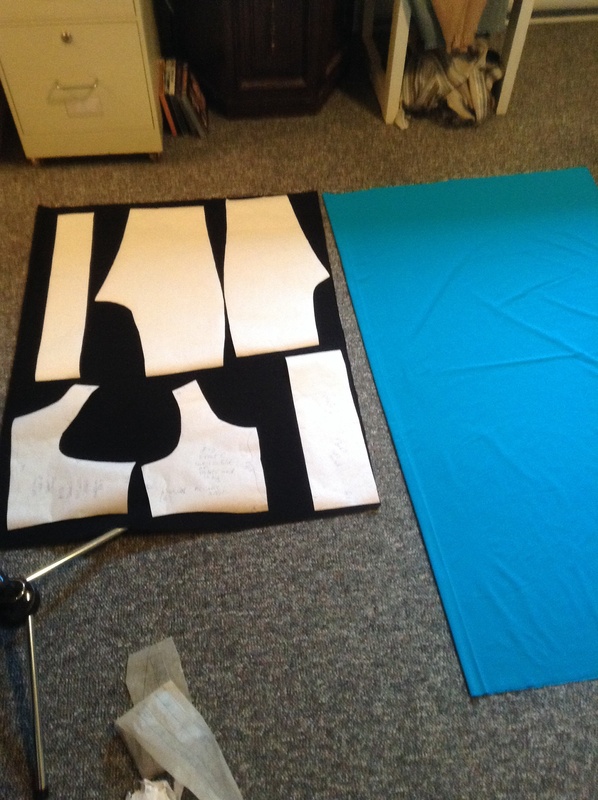 Then I sewed the blue and the lining together and pinned the elastic on to the armholes and the neck opening for sewing later. Then I realized that nowhere in the pattern did they mention putting in elastic under the bust! All they instructed to do was to sew on a blue band of material, no elastic. Well I don’t know about you, but I do know about myself and my sister, and more support was definitely needed to make this top useable. 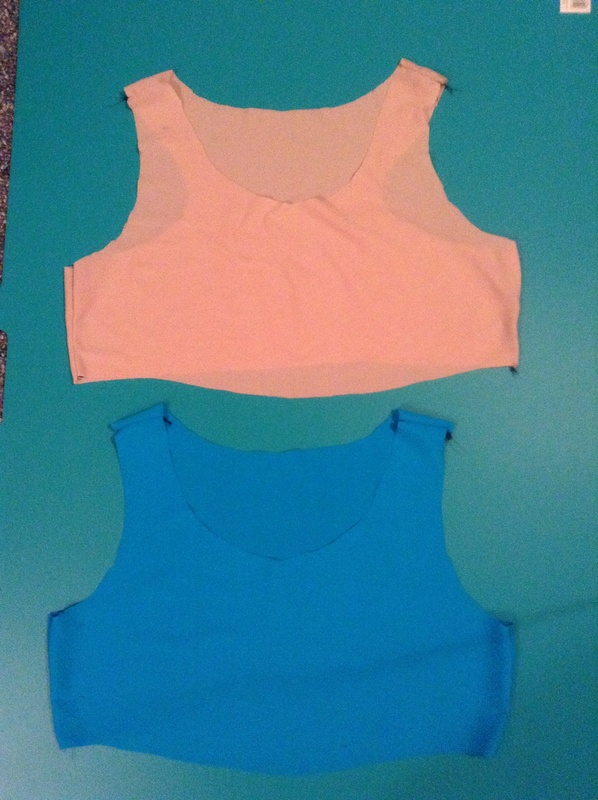 So I measured out the elastic to the length of her under bust size, subtracted a few inches, and sewed it on. As I am, at the moment, unable to have her try it on for size, I will just have to “give it a shot” and alter it later if it is too tight/loose. I also added in a length of elastic string to the front center line of the top to make some pretty gathering there. Now what to do with the band? Back to the pattern instructions, I just sewed the band on, then folded it up and sewed it on again. 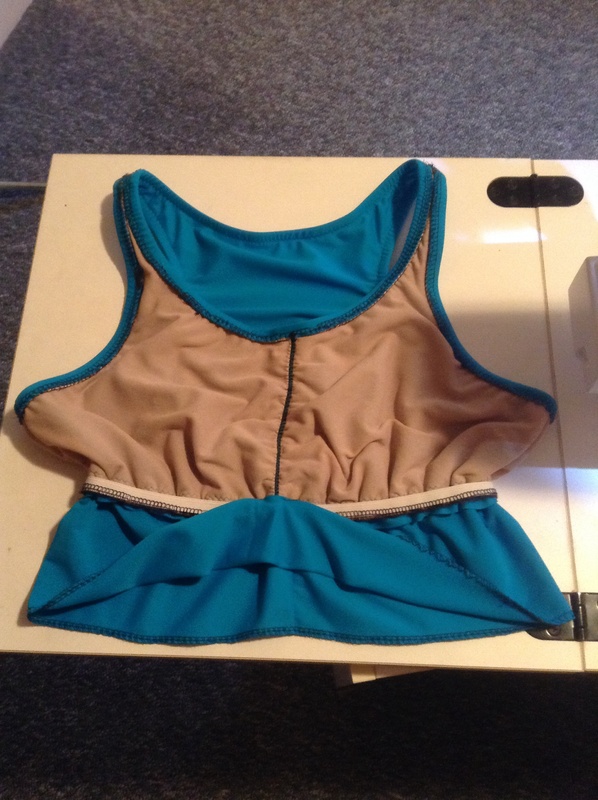 I sewed it on above the under bust elastic to avoid sewing on the elastic too much. You can see the black elastic string on the centre of the top in this shot. At the moment the band on the bra top looks ruffled – kind of cute actually – but when you wear it, it will stretch out smooth to fit you. Voila! The Big Unveil! How do you like it? I think next I am going to try one more thing. I have seen a really pretty fold over ruffled waistband on a pair of yoga pants. I am going to have to figure out how to do that one now. Thank you! It certainly is fun popping out these great outfits! The workout clothes look AMAZING! You did a great job. Joanna of Bon-Bons & Bootcamp can`t wait to get them and wear them. THANK YOU. I hope you start feeling better soon. Looks fabulous, will we see it modeled by the Bon Bons girl? She should model it. She certainly is “buff” enough! I checked out what you made. Very nice! You’re right there isn’t much choice out there! Making your own means you can do what you want, of course, and I love that! Thanks for reading/commenting! Gwen, good job. I really like the leggings with the stripes and I’ve saved into my favorites the pattern with the scrunched up material over the shins. Can’t wait to try making them. I have some “green” fabric that’s actually made from sea shells and crab shells and it’s color is purple! Can’t wait. Gwen I think your leggings are cool. Good job.